As the Maple Leafs’ front office contemplates exactly how, or even if, Nazem Kadri fits into the team’s long-term plans, the pending restricted free agent has given them a lot to think about over the past few weeks. The stretch has been a microcosm of Kadri’s career; a Coles Notes version for the franchise as general manager Lou Lamoriello and team president Brendan Shanahan decide what to do with the mercurial centre, a pending restricted free agent. Kadri has made more headlines than any other player in the final weeks of the regular season — some for flashes of talent that could have the Leafs dreaming of what he could become, some for boneheaded plays that could have the Leafs wondering if he’s worth the headache. The biggest narrative surrounding Kadri as the season winds down is his growing reputation for embellishment. Kadri’s first hit to the wallet this month came Friday when he was docked $5,000 for his second and third diving infractions of the season. The first came March 12 against the Senators and the second March 21 against the Flames. For his part, Kadri has fervently denied he’s prone to embellishment. "I looked at that play again [against the Flames], the guy wound up so far his stick was out of the frame, I couldn't even see it anymore," Kadri said at the time of his fine. "Not to mention the massive welt I had on the back of my leg after that fact. "Whoever's making that decision, I'd like to see them take one of those with no padding and see how it feels. I don't know how I was supposed to react." When Kadri wasn’t immersed in controversy he was playing some pretty good hockey. The seventh overall pick from the 2009 draft earned praise as the catalyst for the Leafs’ 6-5 win over the Ducks in late March, recording four points while lined up against Anaheim star Ryan Getzlaf all game. Kadri followed up that performance with a hat trick in a win against the Panthers five days later. And his defensive game has improved so much under new head coach Mike Babcock, the 25 year old felt comfortable enough to criticize Buffalo Sabres rookie Jack Eichel’s play in his own end recently. Eichel and the Sabres predictably took issue with the slight ahead of the rematch later that month, with the rookie questioning whether it was Kadri’s place to be commenting on his game. If the Leafs’ haven’t yet made their mind up on Kadri, they’re out of luck. Frustrating Kadri showed up again earlier this month when he cross-checked Red Wings centre Luke Glendening in the head area, earning a four-game suspension. 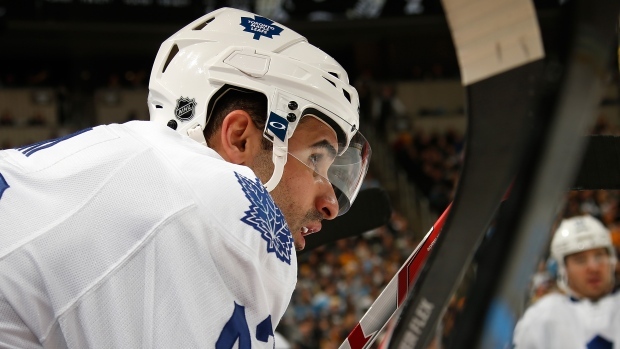 The punishment means Kadri won’t suit up for the Leafs again this season. While he was on pace for a career year in terms of points, the suspension will ensure the London native falls just short in that category. Kadri will finish the year with 17 goals and 28 assists, three goals and two assists shy of his career 2013-14 season. It was a nice bounce back from last year, when Kadri earned a team-implemented suspension, to earn consistent praise from Babcock. But these past few weeks could give the Leafs pause.